Abstract - E-mail service is one of the most important Internet services. E-mail security includes confidentiality, authentication, message integrity, non-repudiation. Pretty Good Privacy (PGP) and Secure/Multipurpose Internet Mail Extension (S/MIME) are email security protocol. They are used to provide security services for email system. PGP is widely used as de facto protocol for securing e-mail. The used algorithms in PGP suffer from problems such as low performance and weakness in encryption. The chaotic encryption system is new trend in cryptography. This paper focuses on designing a new cryptosystems based on chaotic system which makes the complexity of breaking more than the default so the new cryptosystem is more secure. The used chaotic system is built on Lorenz system with random initial conditions which increase the randomness of output sequences. The proposed technique is integrated with the PGP protocol. It is implemented using c# programming language and open source for OpenPGP. The results of proposed system tests show that the security and performance are improved. Abstract - Contemporary enterprises and their business processes are becoming more dynamic, distributed and complex. However, traditional information systems struggle with requirements to provide interoperability due to the dynamic and heterogenous nature of the modern business environment. Modularity concern is a common strategy to a lower application complexity: it results in modules that are easy to maintain, to adapt, and to replace. In this paper, we propose a new approach based on process fragments. We consider a process fragment as an independent part of process. Each activity is encapsulated in an entity named artifact. These artifacts have an interface, a function and manual instruction described with very expressive formal languages that manage high level concepts. On the other hand, the autonomy and heterogeneity of business partners require approaches to describe relations, interactions and collaboration between concerns and to reconstruct the full business process. Thus, this approach investigates this issue by adopting the notion of connectors in order to increase the reusability and to adapt the notion of artifact to the context of partners. Abstract - This paper presents a new watermarking scheme based on Two Dimensional Cellular Automata Game-of-Life for color images in spatial domain. This scheme utilizes the live cells of Game-of-Life generations, in which the two most significant bits of gray watermark pixels are embedded into the color host image pixels in the blue component. The proposed scheme depends on the positions of cells that have the value of one in Game-of-Life generations. The watermark extraction can be performed without the original image, and watermark image is hidden inside the original image. Simulation results demonstrate that the watermark is not visible in watermarked image. The proposed method is secure to resist any passive attacks even though the algorithm is open and robust against various image processing operations. Abstract - Network Coding is a new field for research, which has been growing rapidly. Its ability for improving network throughput and robustness enhancement. Hence the allow coding at intermediate nodes between the source and the receivers in one or multiple communication sessions. In the paper a simulation of different topologies and traffic patterns have been conducted in order to provide better understanding of network coding behavior .The results show that network coding has advantages over flooding show in improved Packet Delivery Ratio. We observed that the performance using network coding is strongly dependent upon the topologies. The study concluded that this methodology might be the promising solution to gradually eliminate the variety of drawbacks of the system as a whole. Karthika A. Nair, Greeshma Vidyadharan T., P. Revathi and Usha Devi G.
Abstract - Mobile adhoc networks are flexible networks consisting of nodes which are mobile and without a wired infrastructure. Due to its dynamic topology, it supports upcoming group applications like spontaneous joint activities and emergency operations. Different multicast routing protocols have been proposed for ad hoc networks each having certain levels of difficulties for routing during mobility of nodes and band-width constraints. Here, a simulation of a set of wireless adhoc multicast protocols is evaluated under various network scena-rios. The relative pros, cons, and area of application of each multicast protocol to different situations are analyzed using parameters like throughput, packet delivery ratio and average end-to-end delay. The Multicast routing protocols like ODMRP (On-Demand Multicast Routing Protocol), MAODV (Multicast Adhoc On-Demand Distance Vector), PIM (Protocol Indepen-dent Multicast) and MOSPF (Multicast Open Shortest Path First) are considered for the evaluation and the simulation is performed using QUALNET. ADINDE Chibuzor Abel, OBI Onyebuchi Charles, Dr. OKOROGU V. N. and NWALOZIE G. C.
Abstract - This study examines the performance of the modulation schemes used in digital microwave communication systems. The bit error rate (BER) performance of different digital modulation schemes is evaluated without taking bandwidth into account, to determine the BER suitable for the energy per bit to noise power spectral density ratio (Eo/No) through additive white Gaussian noise (AWGN) channel. The results showed that the higher order modulation rates are able to offer much faster data rates and higher levels of spectral efficiency for the microwave communications system, but are considerably less resilient to noise and interference. Abstract - During these last years, the use of the web technologies, to involve the Information System of the enterprises, becomes an essential factor to define a new business model. Among these technologies, web services and mobile applications have gathered to integrate existing heterogeneous systems such as e-commerce, e-services hub and e-learning. However, the design and the modeling of mobile client application, on the one hand, and their integration with the existing programs, on the other hand, are still two points open for discussion. The main problem is related to the development technologies that can be used for integrating the existing applications in a new view of the Information System. In this context, the discussion is intended towards the use of technologies based on web services. In This paper, we present a case study to develop a client mobile application for a Web service that is generated from a legacy system. Abstract - It is very important in business or in industry to preserve and protect your data. The need to improve a protected database is important for the accomplishment of a business. To make protected the system from the threats it is important for the development team to be very proactive in developing the database. Abstract - Infrared wireless communication possesses two main attractive advantages over its radio frequency counterpart, namely the abundance of unregulated spectrum in 1.3 �m�1.55 �m region and the ease with which the infrared radiation can be confined. Integrating microwave electronics and optics, it is possible to provide wideband communication services but it is well known that the signal level in an optical wireless receiver is weakest at the front end. 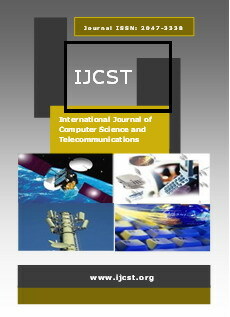 This paper presented allowable signal losses and optical received power prediction based on different visibilities for optical wireless communication links over wide range of the affecting parameters.